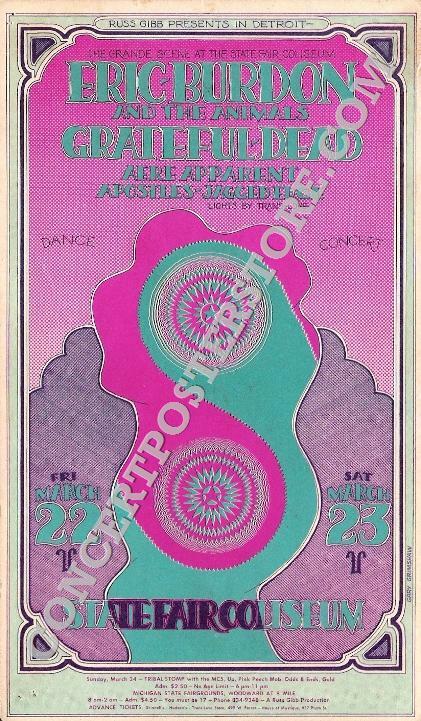 Original 1st/only printing 4 x 7" concert�postcard for Eric Burdon and the Animals with the Grateful Dead, Aere Apparent, Apostles and Jagged Edge at the State Fair Coliseum in Detroit, MI on 3/22-23/1968. Art by Gary Grimshaw, image is #75 in the Russ Gibb Presents/Grande series. Medium thin flat stock card is in very good (B to B/B+) condition; slight wear, a bit of surface smudging, pinholes in the top and bottom left margins, tape pulls on the reverse, still pretty nice overall.